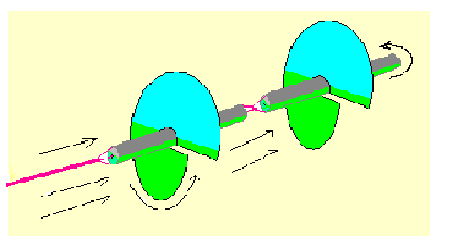 1.If appropriate direction of rotation is chosen it is possible to launch the turbine from the coast, since it is taken by the flow towards the midst of the river. 2.It does not need carrier or supporting device and hence is much lighter and cheaper then other turbines with the similar power. 3.Unlike other floating turbines, it is not constrained by the width of the river. Its length and correspondingly the power are determined by the length of the straight segment of the river. 4.It can be used both to generate significant electric power from large rivers, as well as small amount of power from very small rivers like ones with 10cm of the depth. 5.The construction is very simple from technological point of view. 6.The generator is located on the ground and therefore does not need protection from the water damage and does not require electric cable to carry electricity from the water to the coast. 7.It is ecologically safe. The pollution of water with machine oils is excluded. 8.It is more resistant to floating materials carried by the river. The small size turbines are light and easy to carry and assemble and it can be used by tourists, expeditions, militaries or local residents in high mountainous or other difficult to get areas and extreme environments. The floating turbine which is proposed by us is simpler, more convenient and cheaper then other turbines with similar power generating characteristics. By our estimation, after serial production the cost of one watt generated by our turbine should be less than a dollar.